Preparations for Bear’s 6th birthday party are well under way. In fact, I’m not sure if I’ve ever been this organised for a party two weeks ahead. Time will tell whether I can keep up the momentum! Thanks to some inspiration from here the invitations were super easy to make. At under 10c an invite to print, they were cost effective also. No need to even write on the back, as all the info was right there in the photo. Bear wrote the names on the envelopes before we handed them out at school (in a secret squirrel kind of way as I just couldn’t bring myself to invite the whole class – always such a tricky one that one! What do you do?!). We stuck a piece of magnet on the back of the photo so the recipient could pop it up on their fridge. We just cut up the free advertising magnets that seem to multiply in this house and taped them on using double sided tape. In case you were wondering, that yellow contraption in the photo below is one of the best birthday gifts my mother ever gave me – a double sided tape gun. Love it! To keep with our tradition* of making something from a fridge box for each birthday party we made a lego man photo booth! Thanks to pinterest for inspiration once again and the artistic skills of our friend Jess. The painting was a joint effort between Frog & myself before you go thinking she’s a genius 4 year old for painting so perfectly in the lines. Thanks to Jess once again for helping me create this pin the mouth on the lego man. I love him! As soon as I showed Bear he told me that he liked it also, but told me that he did not want to play that game at his party anymore. ?!?!?! So after a little discussion (no way that effort was going to waste!) we decided that it would still be ok if some of the other kids at his party played it. Phew! We’ve been doing a little pre-party prep in the kitchen as well and popping them in the freezer or in airtight containers and we’re currently in the middle of whipping up some lego bunting and making juice boxes look like lego bricks. Gosh I love party time! Stay tuned for more lego party adventures! Feel free to follow my lego party pinboard on pinterest if you’re looking for inspiration for your own lego party. In addition, some of you will be pleased to know that, as of last week, I am now on instagram! You can follow me over there under @froggoosebear as well as good old facebook as I’ll be far more likely to be popping lego party pics on there sooner than I’ll be getting around to putting them on the blog! You can check out previous FGB parties on our party page over here. Are you preparing for a party of your own? Have you had a lego party? Do you use pinterest to collect ideas? * I pop out the back of our local ‘Good Guys’ store and they are always happy to give me a box or two. For previous parties we’ve made a princess castle, a pirate ship and a rocket. When I was a young girl, ‘birthday time’ was my favourite time of year! My two sisters and I had birthdays all within a four week period. Never combined. Each one a big themed event on it’s own. We had the best games! Mum still has the handmade hats, party bags and invitations from each one. I remember each of us having a spiral bound notebook in which we would write down in detail the plans for our birthday. I have followed the family tradition! Although my mother thrived at ‘birthday time’, I am extremely grateful that my children’s birthdays are a little more spread apart throughout the year! 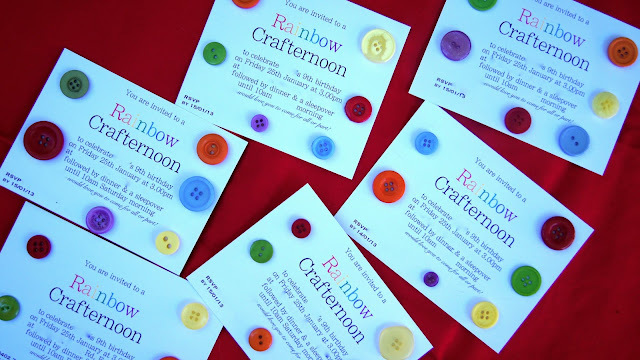 Invitations now sent**, it is time to get our rainbow craft on for the next few weeks! I love the theme! The kid loves craft (bless her xo). To see some more parties from team FGB, head over here. Have you ever made “that” rainbow cake – help??!! Have you ever had 7 nine year old girls for a sleepover – help????!!!!!! * I may have bitten off more than I can chew considering we get the keys to the new house only 5 days before the party and the only way we can accommodate that many gals sleeping over is if we have it at the new house, but I figure they’ll only need sleeping room and all we’ll need for dinner is a BBQ so it won’t matter if we haven’t quite moved anything else over yet… will it?